It’s inevitable that you will need to leave your pup home alone. Some pets handle this well while others react with anxiety, fear and plain-old boredom when they have been left behind. What’s a loving pet owner to do? Veterinarian Katherine Miller of the American Society for the Prevention of Cruelty to Animals (ASPCA) offers her advice. Dogs are a social species and evolve with packs. They bond very strongly with their human companions. The more strongly bonded the dog is and the less experience he or she has being left alone, the more stressful it will be. Too often, people shower new pets with attention, giving the pup days on end of constant interaction. When the daily grind goes back to normal, the dog is left wondering where his playmate went. When settling a new pet into your home, it’s essential to get the animal acclimated to being alone for increasingly longer time periods so they can to cope with the separation. Give the pet toys to play with, especially ones to chew on, so he or she is less likely to nibble your favorite slippers. It’s important that your pet be content in a small space such as a crate, just in case you need to confine the animal for their own safety. “You want your dog to earn house privileges and show he can be trusted,” says Dr. Miller. If you give the dog the run of the house right away, he or she is much more likely to get into things. If the pet is going to be alone all day with little stimulation, make sure it has plenty of stimulation before you go. Go for a long walk or jog or play outside so the pet is thoroughly pooped — even if it means an early morning for you. “If he’s not well exercised, he’ll get bored and get into stuff,” says Dr. Miller. Dr. Miller’s dog has had the same schedule since puppy hood and they have never had a problem. Bottom line: Being consistent is key. Dr. Miller recommends not leaving your pet alone for more than eight hours. You may need someone come let the dog out in the middle of the day or figure out another way for your pup to have a break. 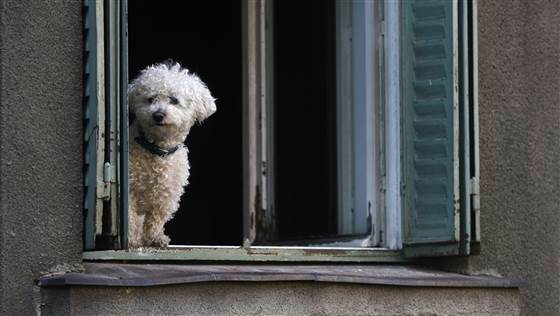 “It’s more humane for a dog’s well-being, not to mention their bladder and bowels,” she says. And when you’re home for the evening, set aside some time for your pooch to exercise and socialize so they aren’t pining for attention while you’re away. A version of this article originally appeared on iVillage. via How to calm your pet’s separation anxiety – Pets – TODAY.com.